Wow, check out this basement! The wall forms are complete and filled to the brim with wet concrete that’s setting even as I write. It took lots of hands working in the hot sun to get there, but the footprint of the house is taking shape and we’re nearly ready to move above ground. Monday was a wild ballgame with Terry, Colin, Cole, Carson, Turner, Kiara, and myself all pitching in. 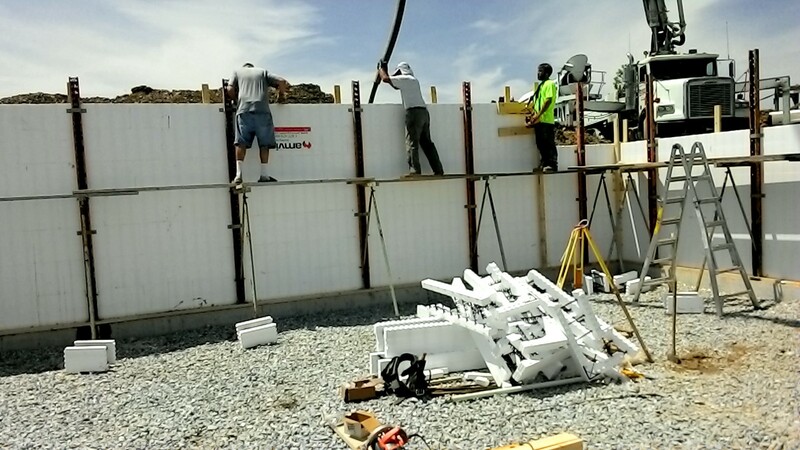 Together we installed bracing towers at 6-foot intervals on the interior of the forms, built a scaffold so we could work higher off the ground, and topped off the ICF walls. The braces conveniently provide a horizontal surface on which we could lay planks for our scaffold, but we didn’t have enough of them, so we used scrap 2x lumber as additional posts. No worries structurally speaking: the posts are temporary and the only weight they need to carry is us, but I’ll admit to you other engineers that these spans exceed L/800 deflection by plenty. To brace the exterior of the forms, where the excavation left little room, we set up a perimeter cleat and some temporary studs. Cole saws the top course flat. Good shot of the bracing towers and scaffold. You may be wondering why the forms look incomplete, with only two sides at full height. 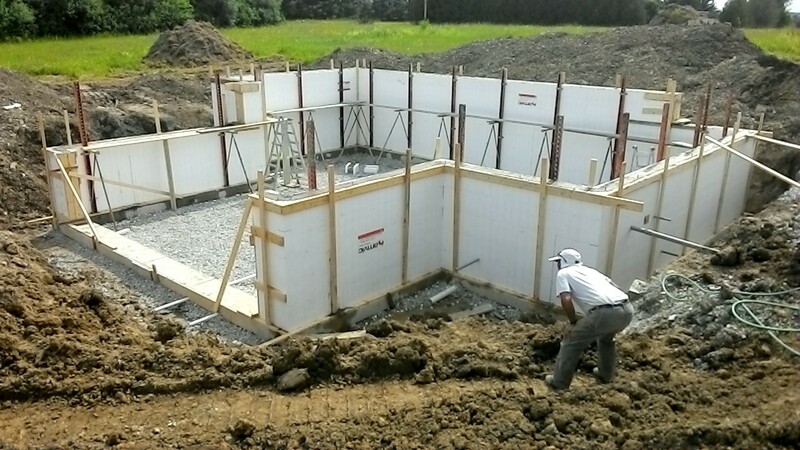 In fact, we have three different wall heights: one for the mudroom (nearly level with the Barn slab), one for the raised first floor, and one for the daylit part of the basement which will have clerestory windows. 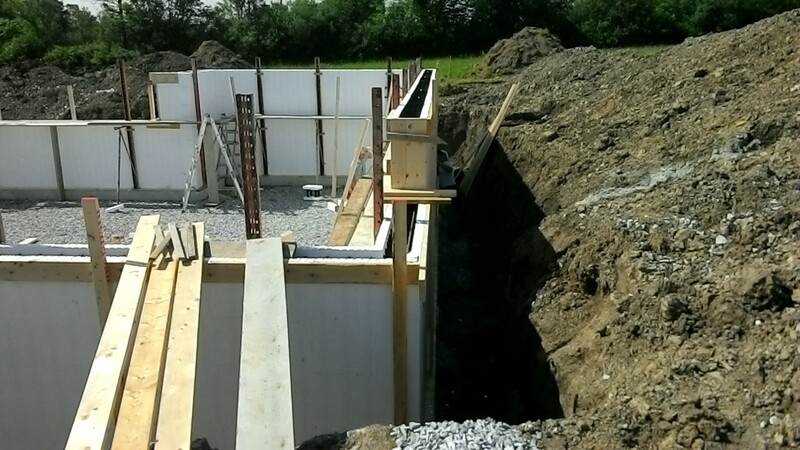 We built timber dams to prevent concrete from spreading out the side. Each ICF Lego piece is 16 inches tall, and annoyingly none of our three wall heights is a multiple of 16 inches. Two are close – half an inch greater – and to reach this height we just shaved off part of the interlocking top nubs. On the 108½-inch wall, we needed to trim the top course by 3½ inches. For each of the 15 blocks in this course we started our trims with a circular saw, finished cutting through the nylon webs with a hand saw, and smoothed the exposed edges with a utility knife. Quite the ordeal. Straightening the wall. Colin’s inside, Terry’s outside. Tuesday at 1pm was our main event, and we prepared amply for the concrete delivery, threading PVC conduits through the forms, checking the forms for straightness and plumbness and twisting the bracing tower turnbuckles as necessary. Harrison brought back their pump truck, then delivered 27 cubic yards (independent calcs by Colin, Terry, and me all agreed on this volume), three mixers full. While Terry guided the hose, Colin followed behind on the scaffold to trowel the top smooth, and Carson and I kept our eyes on the outside and inside of the form to watch for bulging. 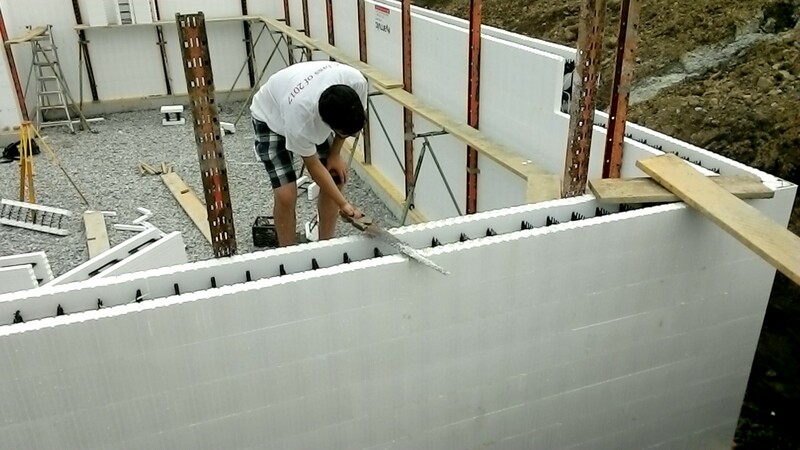 Thanks to our fine bracing job, the walls barely budged. As the concrete began to set, I installed anchor bolts on 4-foot centers. Terry led a final check for levelness (using a transit) and plumbness (eyeballing along each wall), and we levered in a few extra braces to straighten some minor bowing. It’s got to be perfect now… come morning, these walls ain’t moving. 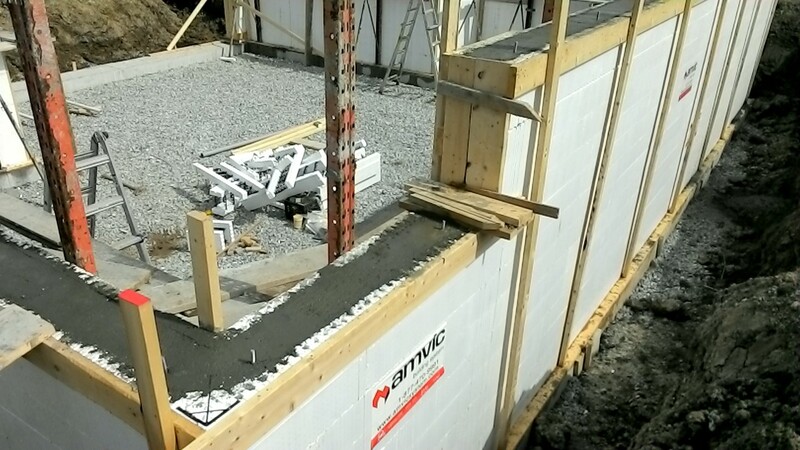 ICFs fully loaded with concrete, plus anchor bolts and a dam.